This week’s M2 Community Report compares the performance of the two most popular Android GPS navigation driving apps: Google Maps vs Waze. We are right in the middle of summer, and we don’t want to waste a second of it driving the wrong route to our destination. Among the GPS traffic apps out there, Google Maps and Waze have the largest share of the Android marketplace. Google Maps and Waze (both owned by Google), can offer highly-targeted and dynamic driving directions and traffic estimates, but with their powerful capabilities, comes great resource drainage. In general, Android GPS navigation apps are known to use high amounts of data, battery, CPU, and more. This can really put your Android device’s battery life and processing speed in jeopardy, so it is important to use the right app that won’t drain too many resources. 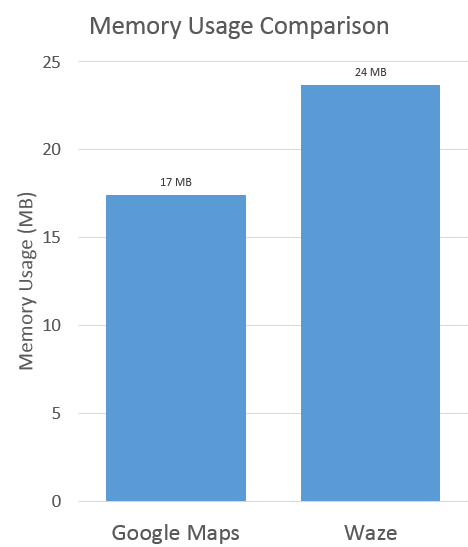 There are plenty of insightful articles comparing the effectiveness, helpfulness, and accuracy of the two apps, but using the M2 Community data provided by True Booster, a free app monitoring app available on Google Play, here is an in-depth analysis on which app (Google Maps or Waze) is eating up the most of your resources. 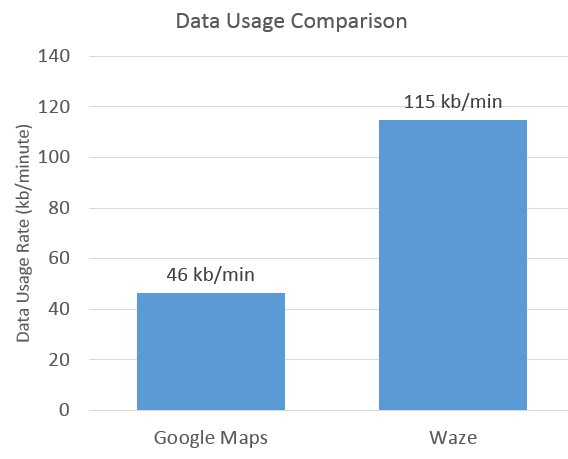 The Waze Android data usage greatly exceeds Google Maps Android data usage by 250%. For anyone with a limited data plan, beware that Waze Android may drain a ton of data if you plan on making any long drives, and potentially lead to high data overage costs. The Google Maps Android data usage rate of 46 kb/minute makes it the clear choice for any Android user with a limited data plan and a long commute ahead of them. Although not nearly as big of a difference as in data usage, the Waze Android app battery usage exceeds Google Maps Android battery usage by about 10.5%. With both of these apps using a decent amount of battery, make sure that your device is charging when running these apps. 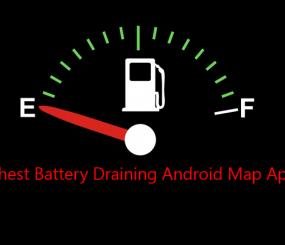 If you’d like to see how much battery other GPS navigation map apps consume, check out our article on battery-draining map apps. 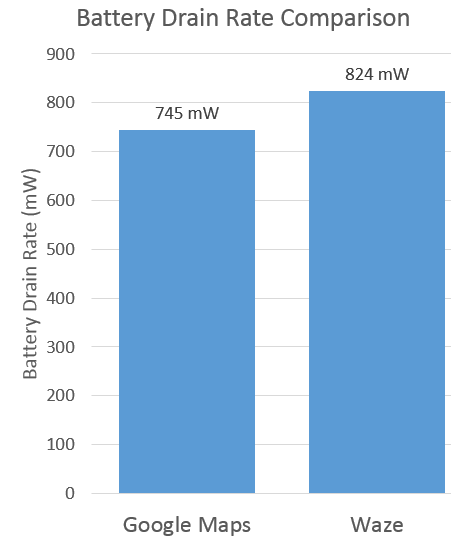 The Waze Android background battery drain rate exceeds the Google Maps app battery drain rate by 285%. This is just another reason to make sure to close out any apps you are not using. 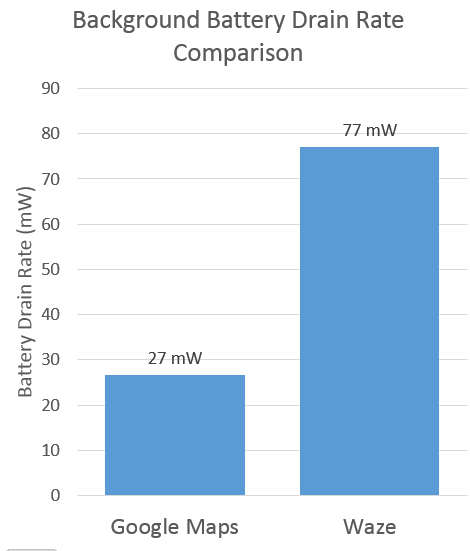 These background battery drain rates may not seem excessive, but overtime, background running GPS apps can have a huge impact on your device battery life. Although only a slight difference, Google Maps Android usage exceeds that of Waze. 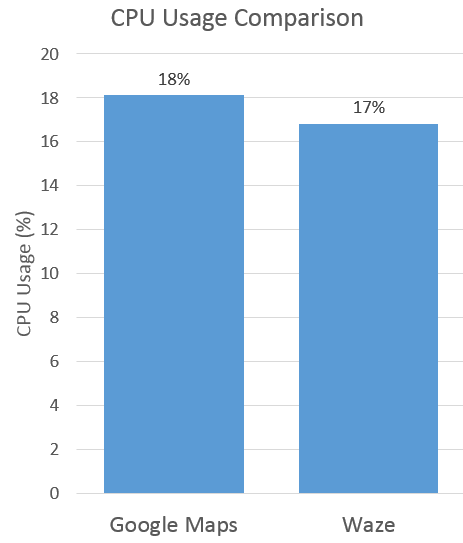 A high CPU usage may lead to a slower processing speed, meaning Waze may run faster on your device. Google Maps proves to be more efficent with regards to Waze, as well. Conclusion: Google Maps Android is a superior-performing GPS traffic navigation app. From our M2 Community study, gauging the app usage habits of users worldwide, we have determined that the Google Maps Android app is a more efficient resource consumer than the Waze Android app. Google Maps uses significantly less data and battery than Waze, so for your next drive, make sure to use Google Maps to ensure you have enough battery life and data left to enjoy your destination!